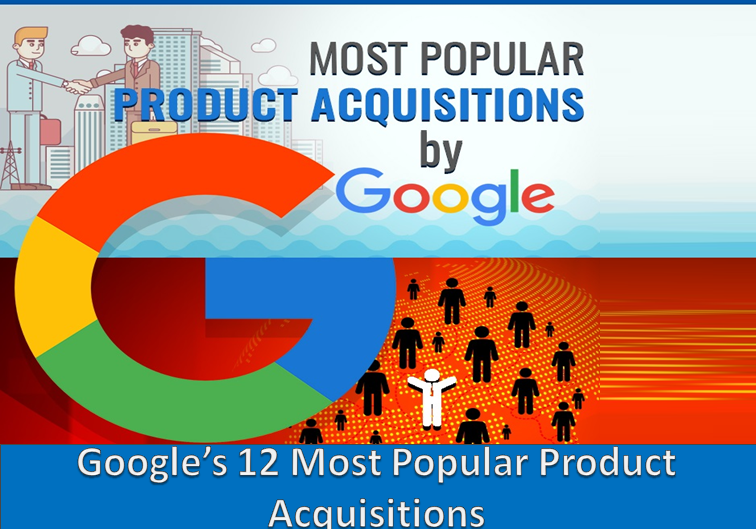 Even though, Google’s primary source of income is online advertising, Google which reorganized itself under a new umbrella called “Alphabet” in 2015, has made acquisitions in companies across various verticals. As of December 2016, Google acquired 200 companies and Motorola Mobility at $12.5 billion is their largest buy. Google bought out YouTube in 2006 for $1.65 billion. Everyone was wary if Google would be able to make money on this platform. But now, a decade later YouTube is one of Google’s core products with the global shift in preference from television to online videos. 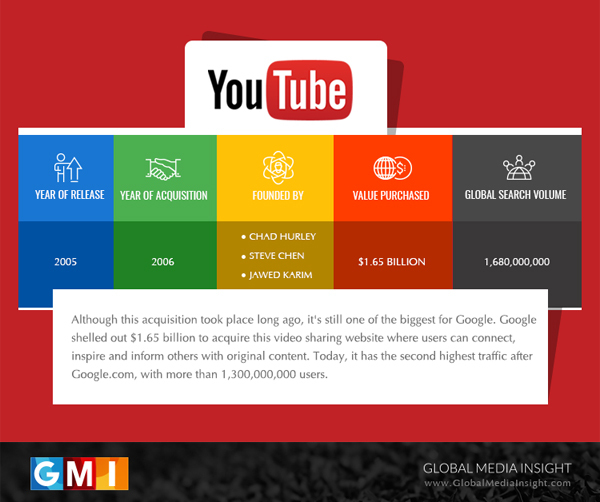 YouTube also is strategically aligned to Google’s search offering with more than 1.3 billion users on board. 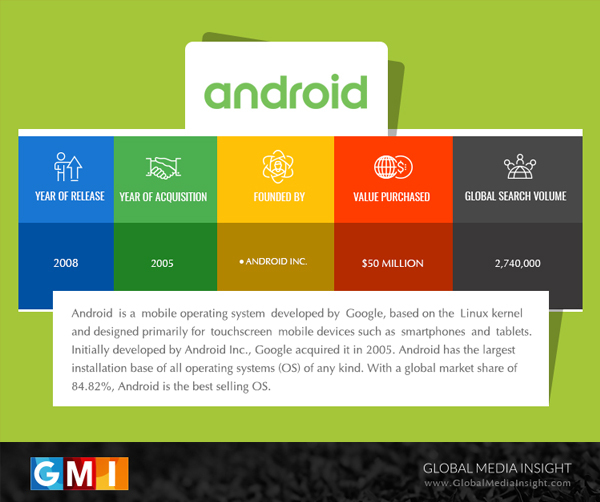 Purchased for $50 million in 2005, Android is often touted as Google’s best acquisition till date. The world’s most popular OS, Android does not really make money directly from Android, but it helps drive activity on mail and mobile which Google can then monetize. 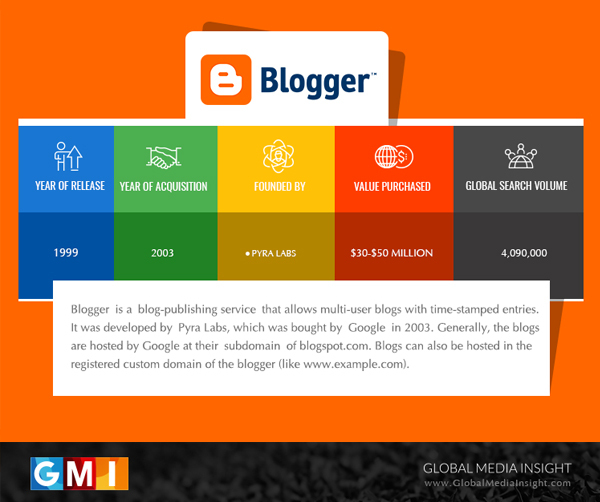 Blogger from Pyra Labs was one of the first in Google’s acquisition trail, dating way back to 2003. The easy-to-use blogging platform has seen its user base expand to millions since Google bought it over. Google Analytics was initially owned by Urchin Software and was acquired in 2005 for an undisclosed sum which is slated to be between $30 million to $50 million. The Google Analytics platform is used by more than 55% websites today. It lets website admins understand where their traffic is coming from. 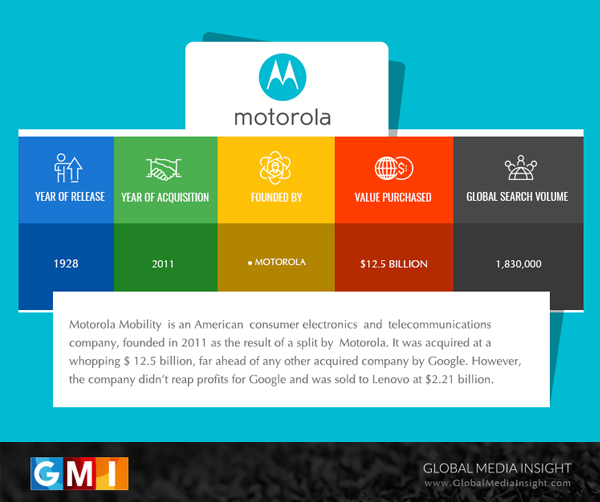 Motorola was acquired at a price tag of $12.5 billion in 2011. The patents that Motorola held were believed to be the reason for this acquisition. The company later was sold off to Lenovo as it became unprofitable but Google did retain the majority of the patents. 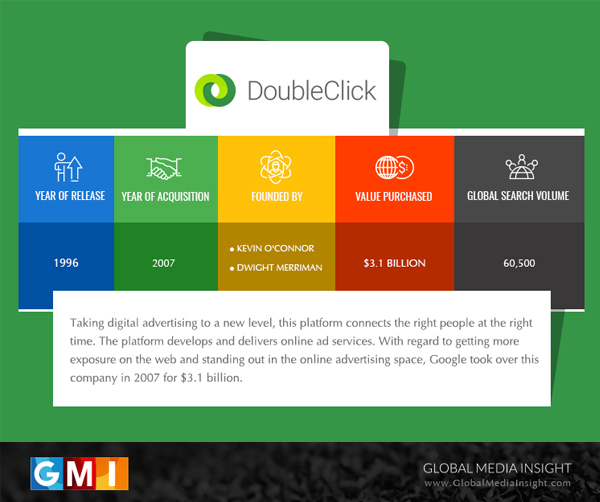 Google acquired DoubleClick in 2007, after winning a bidding war with Microsoft. It was Google’s heaviest acquisition that time at $31.1 billion, but it has managed to pay more than it was paid for and has given Google a firm foothold in display advertising. 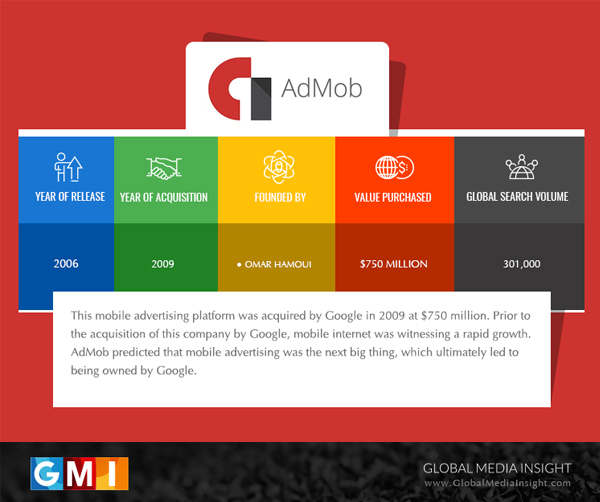 Google predicted that mobile advertising was the next biggest business avenue and quickly bought over AdMob in 2009, shelling out $750 million. Following on the heels of its acquisition of Nest Labs in 2014, Dropcam and Dropcam Pro Wi-fi helped bolster the home automation line of products that Nest Labs had to offer. Purchased for $555 in 2014, Dropcam offers video monitoring and security technology. Waze, the GP-based navigation app allows Google Maps to give accurate predictions in travel time and alternate navigation routes as it used social traffic data. Waze is also expected to bring mobile ad dollars. Google spent more than $1 billion dollars for Waze in 2013. Founded by Tony Fadell, who is recognized as “the Father of the iPod”, Nest Labs makes smart smoke detectors and thermostats. 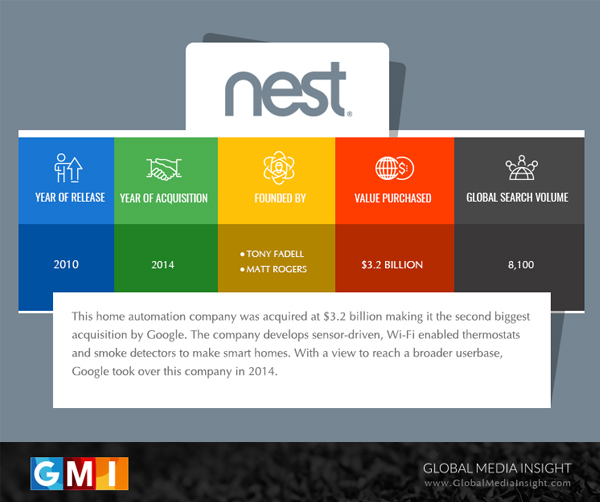 Acquired for $3.2 billion in 2014, NestLabs was acquired to expand Google’s presence in homes of consumers. Terra Bella or SkyBox Imaging was acquired at $500 million for Google Maps and give access to up-to-date and accurate images. 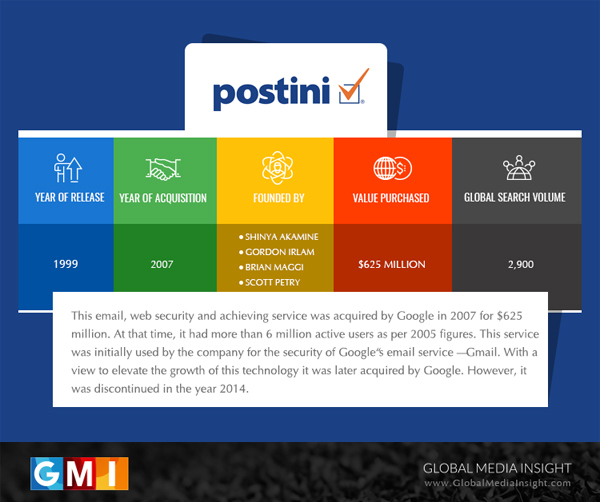 Google decided to acquire Postini after using it under license to amp Gmail security. Acquired for $625 million in 2007, it was discontinued later in 2014. Larry Page, Google CEO, puts companies through a toothbrush before deciding if it is worthy of spending millions or even billions of dollars for it. The toothbrush brush test is simply asking if it is something you will use once or twice a day and whether it improves your life in anyway. Are you looking for ways to harness Google’s capabilities to bring in more business? With more than 16 years in the digital realm of UAE, Middle East and India, GMI’s SEO Digital Specialists understand all the nuances of the search giant. Talk to us today to truly tap into all of Google’s amazing capabilities.